Change Your Password and Update Your Profile – Before you do anything else, your first step should be to change your password to something secure that you can easily remember, and to update your ConnectVA member profile. The Member Directory is searchable, so we recommend you add a photo, your contact information, and links to your social media sites. Update Your Organization’s Profile – If you haven’t updated it in a while, make sure your organization description, social media sites, logo, and point of contact are all up-to-date so ConnectVA users can easily find current information about your organization. 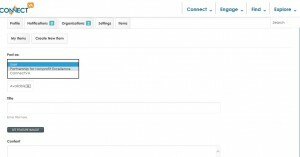 Using Your ConnectVA Dashboard – Need to edit a job? Want to remove a claimed item from the Item Exchange? You can manage your profiles and listings in your pop-out dashboard. Request Membership to Your Organization – Did you know that multiple people can manage your organization’s listing and post jobs, events, and more? 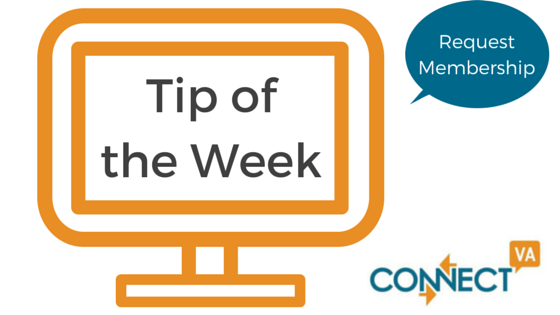 Make your organization more accessible by encouraging your whole team to create ConnectVA accounts and request membership rights. 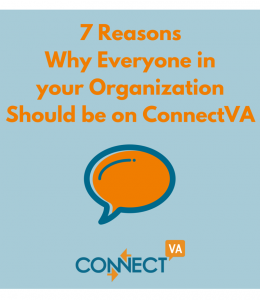 7 Reasons Why Everyone In Your Organization Should Be on ConnectVA – Speaking of your team, we’ve highlighted all the ways your organization’s staff, from Intern to Executive Director, can use ConnectVA to make their jobs easier. How to Edit and Promote a Job Posting – Whether you need to change the job description or are looking for ways to make your listing more visible, this post is for you. Post or Update an Event on the Community Calendar – Planning your next event and need to cross-check for good dates? 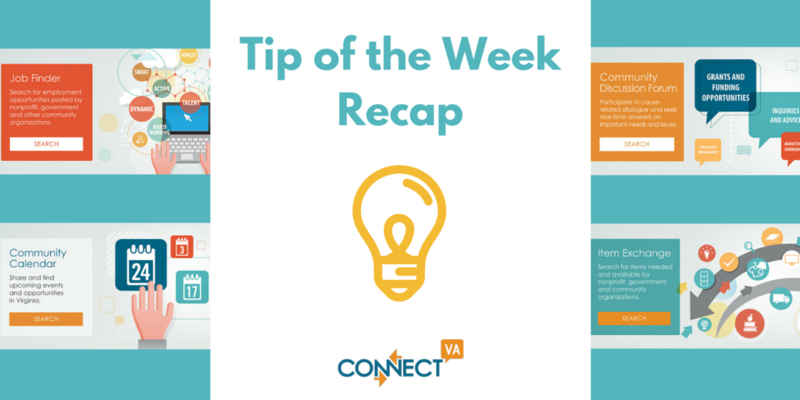 The ConnectVA Event Calendar is a great tool for planning and promoting your public event. Subscribe and Post to the Discussion Forum – Use the ConnectVA forums to post news and announcements, funding opportunities, get advice on marketing and volunteer management, and more. Anyone subscribed to a particular forum will get notified of your posting by e-mail. 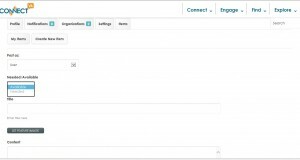 Posting in the Items Exchange – Learn how to use our Items Exchange to post in-kind donation needs or available goods for donation. ConnectVA’s Got Your Ticket to a Learncation – A summer staycation is a great time to invest in your professional development. Learn about how to use our Resource Library to ramp up your skills. What other topics would you like to see covered? Tell us in the comments below! Have a question not answered here? Visit our FAQ page, or e-mail us for assistance. You may have heard about the “staycation”, but what about a “learncation”? You don’t have to travel to take a learncation. You don’t even have to leave your desk. Put some time on your calendar to take an educational journey to the ConnectVA Resource Library. 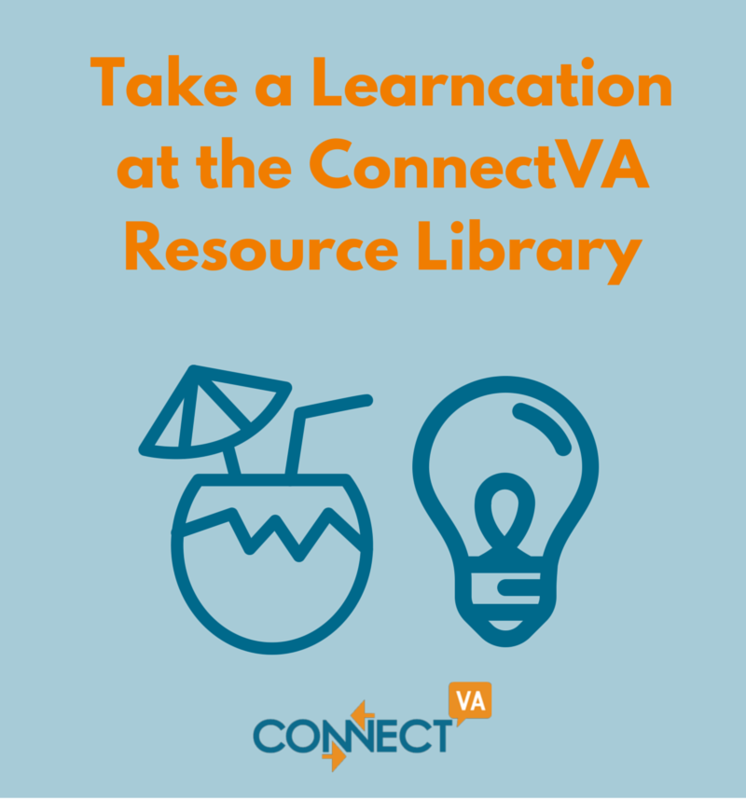 The ConnectVA Resource Library, powered by 4Good, is a virtual library of resources, webinars, tool-kits and reports on a variety of popular topics, such as board governance, fundraising, technology, management, marketing, and more. With the Resource Library, you never have to miss another webinar, because they are all archived and available 24/7 online. Whether you need sample policies, or a refresher on a topic you haven’t explored in a while, the possibilities are endless! Access to most articles and webinars is free, but some e-books and guides are available for a nominal fee. You can use the widgets on ConnectVA to search for resources on popular topics, or go straight to 4Good for more. First, create a free 4Good account. Enter your name, e-mail address, and desired password. While logged in, in the search bar, search for ConnectVA. Then click on Organizations under Type. Then click on the ConnectVA 4Good organization account. 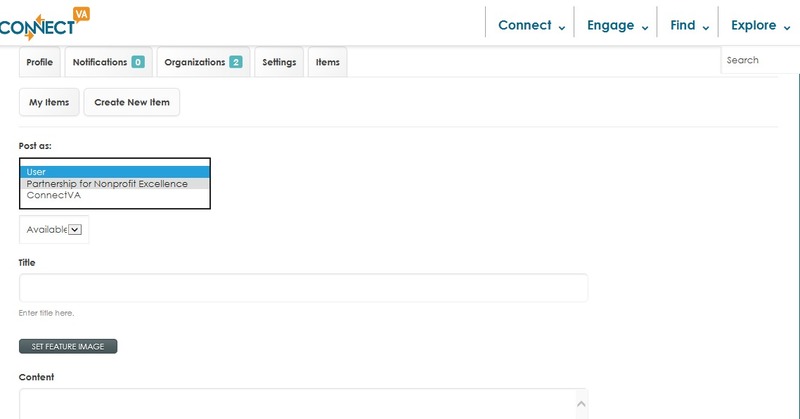 You can now explore ConnectVA’s library. Don’t forget to “Subscribe” (follow) our activity to receive notifications of new resources in our collections! First, you’ll need to create a collection. Do this by clicking on the plus sign in the top right corner of your screen. Then, click on Next under Collection. Enter a title for your collection and click save. You must Add Body Text and some tags for your collection. You can also edit how your collection appears (style), who can edit the collection (collaboration), see analytics, and add your own files. When ready, click on Publish. Go back to the ConnectVA Library. Locate a resource you want to add to your collection, such as “The Leader as Coach: Guiding Your Team in Dynamic Change” – a webinar – and click on Collect. 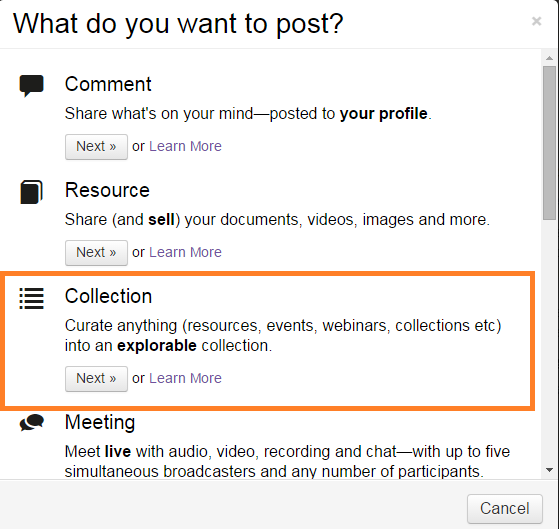 Add the webinar to your collection and click save. To get back to your Collection, click on the avatar in the top right corner of your screen and then on Dashboard. Scroll down slightly to find and click on your collection. Next, click on View this Page as a Visitor. 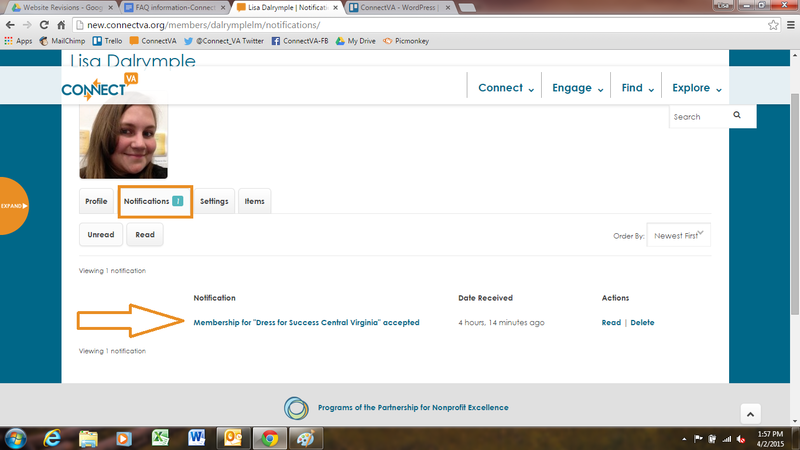 You will see the share tools and can click on the @ symbol to e-mail your collection to your board member. 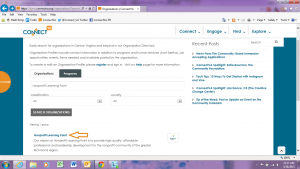 Do you use 4Good to post nonprofit management resources? We’d love to include it in the ConnectVA collection. E-mail us at admin@connectva.org. Tell us all about your Resource Library Learncation in the comments below. Happy learning! Break down the silos – With multiple member-administrators, everyone has the opportunity to be “in the know” about what’s being posted on behalf of your organization, and anyone can make changes. For example, if someone is out sick, and you need to edit an event or job post, you need not wait until he/she returns or sign-in using their email and password; you can make the change yourself with your own account (using your email and your own password) that’s also attached to the organization. Development Staff – Get your annual events on the ConnectVA Community Calendar early, and stake your claim. Be the first to know about grants and funding opportunities by subscribing to the Community Discussion Forum (click subscribe at the top of the forum). Post in-kind donations needed in the Item Exchange. 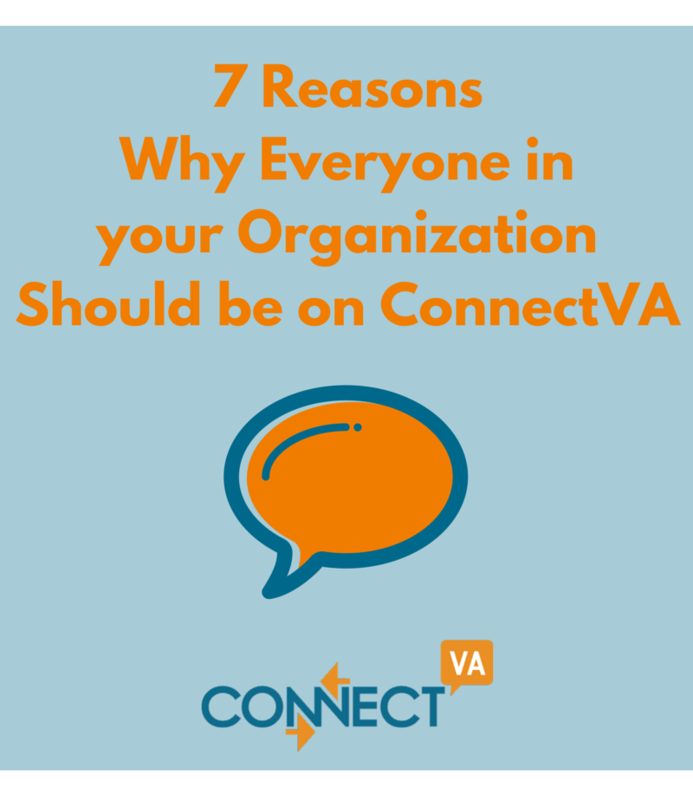 Human Resources Professionals – This one may be obvious – since the Job Finder is our most popular feature – but if you’re responsible for recruitment at your organization, you should definitely be registered on ConnectVA. As a member-administrator of your organization, you can post jobs, internships, and RFPs easily, for the low cost of $55 per listing for 30 days. You can also look out for Professional Development opportunities for staff through the ConnectVA Community Calendar by searching under “Professional Training”. Interns – Help keep your organization’s listing current, and gain access to ConnectVA’s daily and weekly update e-mails to learn more about the nonprofit sector. Check out our Community Calendar for upcoming free and low cost webinars and classes to gain new skills. Marketing/Communications Specialists – Share your news and announcements, like a press release, in the Community Discussion Forum or ask a question in specialty forums like Communications and Marketing. Need to hire a graphic designer for a special project? Post an RFP in our Job Finder. Executive Directors – Looking for opportunities to collaborate with your peers? 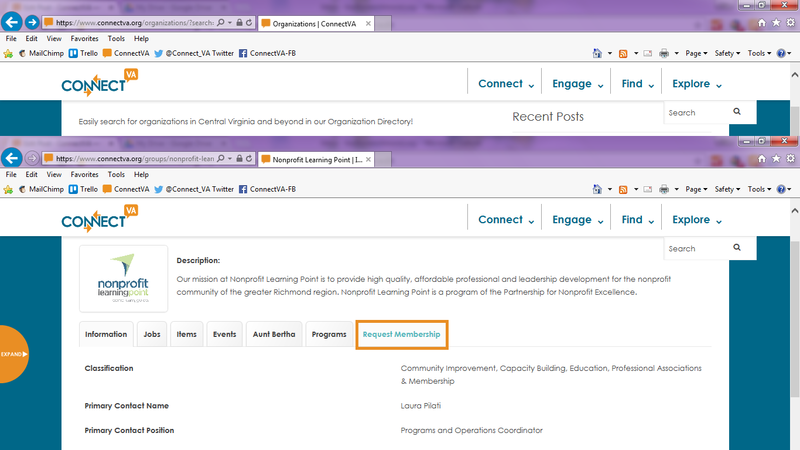 Register and complete your Member profile, to make yourself accessible to other nonprofit leaders. Looking for a new space for your nonprofit or moving and want to give office items to another organization? Check out the Item Exchange. Looking for a consultant to help with Strategic Planning? Post an RFP in our Job Finder. Smooth transition when someone departs – Having more than one member-administrator of your organization listing makes it much easier to maintain when someone leaves. If your only member-administrator has left and you need assistance with getting your listing updated, contact us at info@connectva.org. This is just a short list of the many different ways that different staff members can take advantage of the resources and tools on ConnectVA! 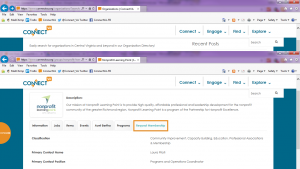 Step 2 – Log in and find your organization listing in the Organization Directory. Click on your organization name. Step 3 – Locate the Request Membership tab and click on it. Enter your comments and click on Send Request. 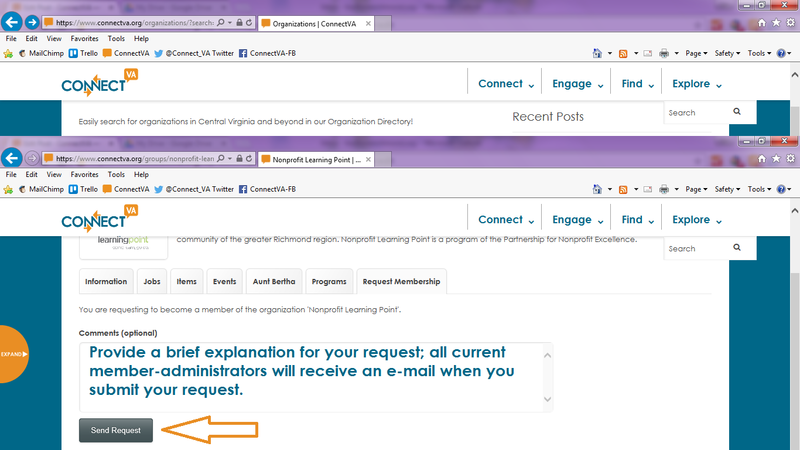 Step 4 – All current member-administrators will receive an e-mail with your request, and any current member can approve it. Voila – you are now a member-administrator of your organization! 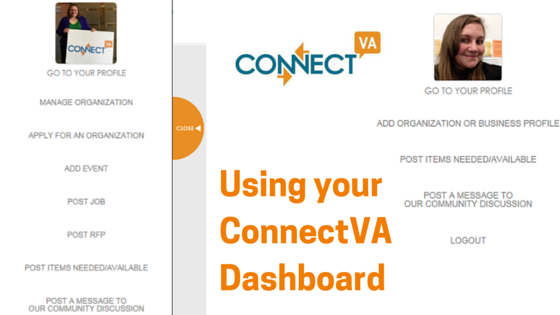 If your organization is not listed on ConnectVA, once you’ve registered and signed in, click on Add Organization or Business Profile from your dashboard and apply for a listing. The ConnectVA team will review and approve it. Businesses can take advantage of this too! If you have a Business Network listing on ConnectVA, ask other members of your team to register for a ConnectVA account and request membership to your business. They’ll be the first to know about hot topics in the sector, and can help you maintain your listing. Not registered on ConnectVA? Click here to get started. Logged in recently and feeling lost? Follow the yellow brick road! (or in this case, follow the orange dot). The Dashboard (a pop-out menu that expands and closes) is your key to managing your personal, organization, and/or business profile. 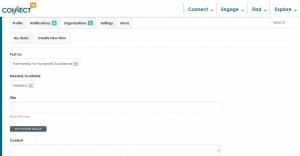 Need to edit a job or event listing? You can take care of that from your Dashboard too. 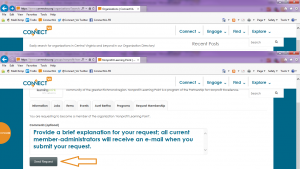 If you have an account and are a member-administrator of an organization, you will see the option to edit your (personal) profile, manage your organization’s profile, apply for another organization listing, add an event, post a job or RFP, post items needed (for your organization) or available, and post messages in the Community Discussion Forum. All of the corresponding orange tabs below it will take you where you need to go. 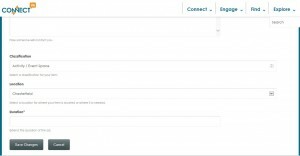 Don’t forget you can have multiple member-administrators of your organization, so you can manage membership requests here too. If you have an individual account, you will see the option to edit your profile, post items available, and post messages in the Community Discussion Forum. Click on Go to Your Profile to add your social media accounts, upload a profile photo, or change your password. 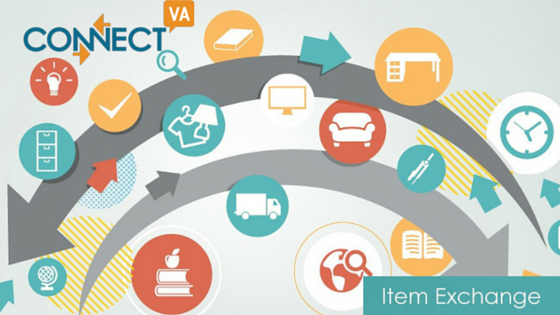 If you posted an item available, you can edit that listing in your personal profile as well. If you have an account and are a member-administrator of a business, you will see the option to edit your (personal) profile, manage your business profile, apply for another business listing, post items available to nonprofits, and post messages in the Community Discussion Forum. – click on the orange Manage tab. All of the corresponding orange tabs below it show where you can make changes. If you have a premium business listing, you will also see an option to add your business logo. If you would like to post an item you have available, you will first need to Register or login. Once logged in, Expand your Dashboard, and click on Post Items Needed/Available. 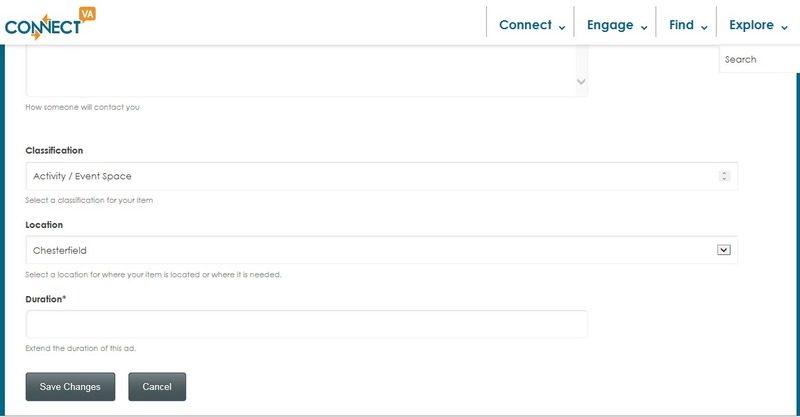 If you are a member-administrator of an organization or business, you will have the option to post the item available as yourself (user), your organization, or business. Select Available. New feature! 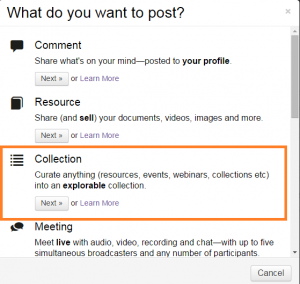 Upload an image of the item to show organizations what you have to offer. Click on Set Feature Image. Be sure to enter your contact information, include the condition of the item(s) in the description and delivery instructions, choose an appropriate category in Classification, and add how long you would like your ad to run. Click on Save Changes and your item will be published! You can edit or delete your item by logging back in and accessing either your user profile (if you posted as yourself), or your organization or business profile. Visit our FAQ page for step-by-step instructions. If you would like to post an item needed, you will first need to be a member-administrator of an organization. (Only organizations may post items needed). Not a member of your organization? Click here to get started. While logged in, Expand your Dashboard, and click on Post Items Needed/Available. Choose your organization from the drop-down list (NOT user), and select Needed. New feature! Upload an image of your item or a prototype of what you’re requesting. Be sure to enter your contact information, choose an appropriate category in Classification, and an ad duration. Click on Save Changes and your item will be published! 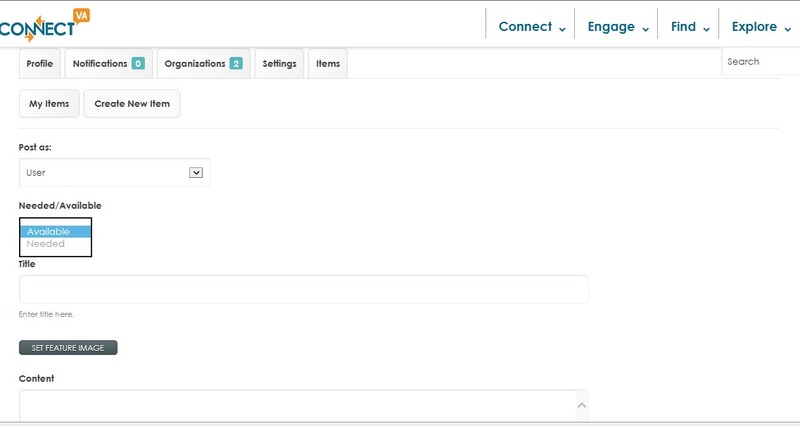 You can edit or delete your item by logging back in and accessing your organization profile. Visit our FAQ page for step-by-step instructions. Do you send out an e-newsletter or post on-site announcements? Promote your in-kind donation needs to your constituents by linking back to your ConnectVA item listing. Looking for volunteers or volunteer opportunities? Check out our Volunteer & Board Service page or visit HandsOn Greater Richmond. Please do NOT post volunteer needs or availability on the Item Exchange. If you currently work, volunteer for, or serve on the board of a nonprofit organization listed on ConnectVA, you can request to be a member-administrator of your organization. 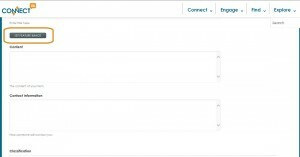 One of the great features of ConnectVA 2.0 is that organizations listed in the Organization Directory can have multiple member-administrators. Why is this important? Multiple representatives of an organization can share the responsibility of maintaining listing details, post jobs, events, etc. In addition, the ConnectVA membership community will have the opportunity to view your member profile, and gain greater accessibility to your organization’s team. Visit the Organization Directory page and search for the organization in which you would like to request membership. Click on the organization name. Then, click on Request Membership, enter comments, and click on Send Request. A current member-administrator can approve your membership (it will be sent to all current member-administrators). You will receive a confirmation e-mail when your membership request has been approved or rejected. You will also see a notification in your member profile when your membership request has been processed. You can access this by expanding your dashboard and clicking on Go to Your Profile. You can be a member of more than one organization. If you would like to add yourself as a member-administrator of a business listing, the process works similarly. Note: You cannot be a member of an organization and a business from the same ConnectVA account. If you’re currently a member of an organization, and wish to be attached to a business listing, you must create a new account for that purpose, and vice-versa.